I found some time to read a book, A History of Beekeeping in British Columbia from 1950 to 2000, and have thoroughly enjoyed it. Like most prairie dwellers, I have trekked out through beautiful British Columbia as often as possible. So I am somewhat familiar with the areas the book delves into – places with the names Central Cariboo, Skeena Valley, East Kootenays, and Maple Ridge, among many others. These names always conjure great memories of gorgeous scenes and wonderful places. But I lingered longest among the dozen pages devoted to the Peace River Area. When I was but a teenager, I drove up to the Peace, thinking I should become a beekeeper there. The scenery is wonderful. The Peace River, a part of the Arctic-bound Mackenzie watershed, is dramatic and inspiring. But, of course, it was the rumours of 300 pound honey crops grown from packages of bees that really enticed me. As it turned out, an opportunity opened up for me in Saskatchewan, instead. But I’ve often wondered how my life might have evolved had I gone to work for Ernie Fuhr, or the Van Hans, or someone else up on the Earth’s rooftop, and then slowly began building my bee farm somewhere just off the Alaska Highway. When I read the BC Bee History and the clips about 430 pound averages, well it seems whimsical now. I’m glad that the author, Douglas McCutcheon, has collected the stories of the bees and beekeepers that belong to these places. Part of the great beauty of British Columbia, and the great challenge in preparing a book like this, is centered on the extreme diversity of climates, agricultural regions, and environmental domains of the province. The author does a nice job of pulling it all together. From rocky-peaked mountains to foggy islands, bucolic pastures to rolling plains, BC hosts beekeepers everywhere, all with unique conditions, many with unusual forage crops, some engaged in a climate with Mediterranean bliss, others struggling in a severe continental environment. It all makes for an interesting compilation. 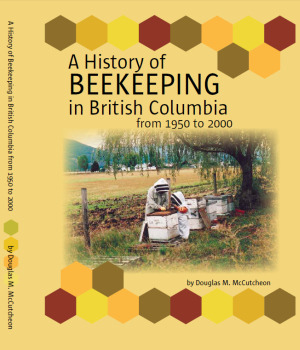 There is a lot to enjoy in the History of Beekeeping in BC. We tend to ignore our history too readily. And that condemns us to make blunders that might have been avoided. But the real joy in a book like this one comes from reading the dozens of sketches about the characters who were beekeepers last century. What would beekeeping be without “characters” anyway? Who would dare keep bees, if not the folks who live a tad bit differently from the rest of society? We are indebted to Doug McCutcheon and the editors and assistants at the BC Honey Producers Association who worked so hard to capture the memories, organize the stories, and publish the book. To them, many thanks. If you would like to get a copy of this interesting book, you can order it by visiting the BC Beekeepers’ website. The book is large-format, contains 334 pages, over 100 photos, and covers a lot of interesting history. A bargain for $30. All proceeds beyond recovering the cost of production will be donated to the Boone Hodgson Wilkinson Trust Fund for Honey Bee Education and Research. This entry was posted in Books, History and tagged British Columbia, Peace River. Bookmark the permalink.